Artists Tattfoo Tan and Abigail DeVille dig in the dirt to find possibilities for renewal in their exhibition at Bronx River Art Center. The Bronx River Art Center (BRAC) is currently home to an exhibition that calls attention to issues such as “urbanity and nature, decay and environmental stewardship, and loss and congregation,” according to Gallery Director and Curator, José Ruiz. Introducing a four-part series called “DIALECTS,” Ruiz pairs local Bronx artists with foreign-born artists from countries underrepresented in the global art scene, as a response to the borough’s own position in the New York art community. “The Bronx has a long history of presenting new, alternative artistic outlets and voices to the New York art world. Having said this… Bronx artists have to work extra hard to be seen and be noticed. It is still hard to get other curators, critics, and collectors to come to the Bronx, and this is a real problem. It is up to Bronx organizations to support their artists and put them in platforms that will help their artistic career.” Part one of this series is called “Black Gold,” and it features site-specific installations by Bronx native Abigail DeVille and Malaysian-born artist Tattfoo Tan. “Black Gold” addresses the heady issues mentioned above via two galleries and one bathroom installation. Tattfoo Tan, known for conceptual interventions involving food and consumption, continues his yearlong cultivation project S.O.S. (Sustainable. Organic. Stewardship.). 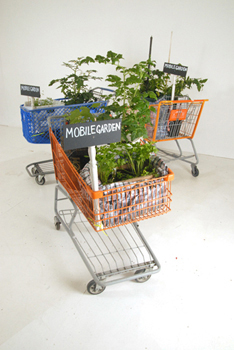 Tan’s living sculptures, Mobile Gardens, reside in the gallery though they are brought outside periodically throughout the day so the herbs and tomatoes can drink in the sunlight. The sculptures, made of discarded shopping carts and found materials including laundry detergent bottles, reflect both decay and renewal. They force us to question what we eat, how we use our land, why we are wasteful with food and with our materials, and they suggest new ways to consider these questions. Nearby, on the floor sits an old suitcase, no doubt another found material. 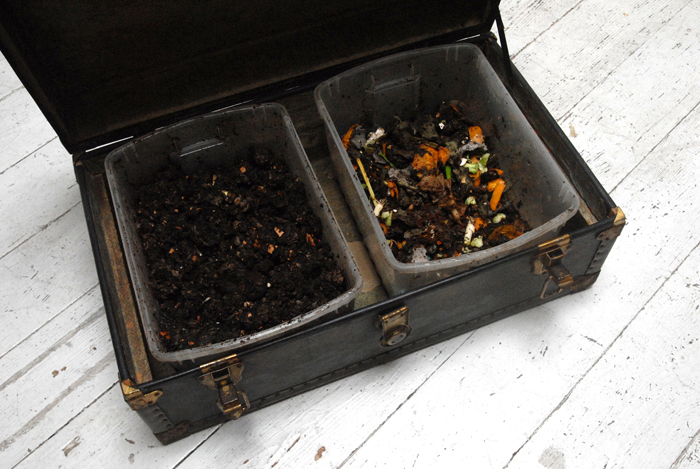 Inside are two plastic bins of dirt and composting worms. 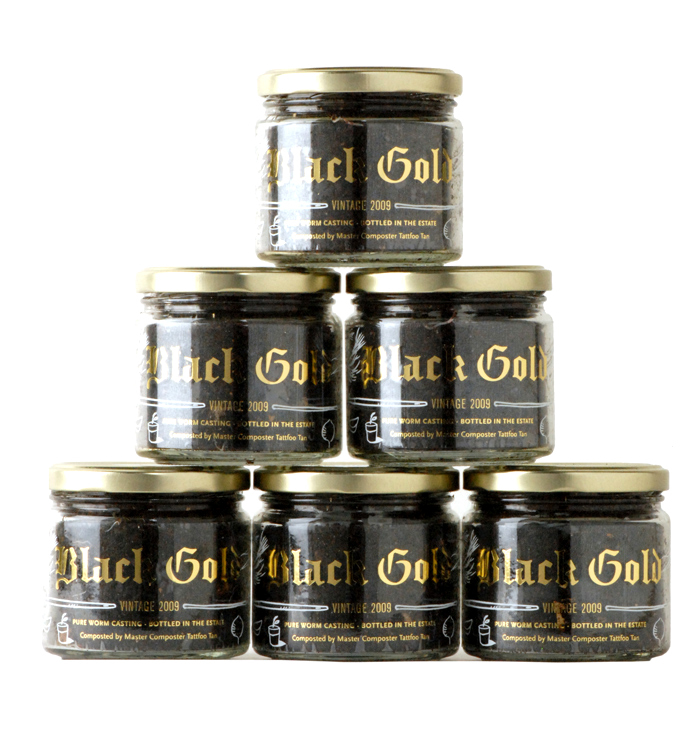 Tan, who is a certified Master Composter, transfers the contents into individual glass jars labeled “Black Gold,” named after the term farmers use to refer to rich, composted soil. Each one is for sale, and priced according to the current value of gold, making them rather pricey jars of soil. Currently at about $9,000 a jar, is it art meant to be left untouched and admired, or should the purchaser use it in his/her garden? Tan leaves this up to the individual, but does suggest there is a special recession price for the asking. Tan’s certification as a Master Composter comes after 21 classroom hours and two field trips, as well as 30 hours of volunteer outreach in compost education and promotion. 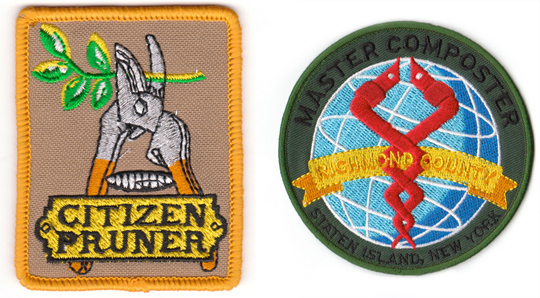 According to Tan, this is “an essential horticultural and waste management practice that benefits our community and the environment.” The artist’s gray work coveralls, self-designed patches, and his certificate from the program hang on a wall near the compost bins and Mobile Gardens. 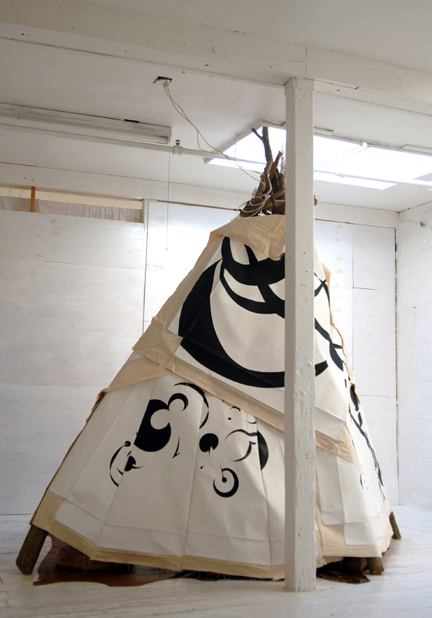 In one of Tan’s other creations, a re-imagining of a teepee called Teapi, artist Abigail DeVille has staged an intervention, placing her own paintings inside the structure. DeVille’s work continues in the second gallery where the installation “What happens to a dream deferred?”…SUPERNOVA takes over the room. 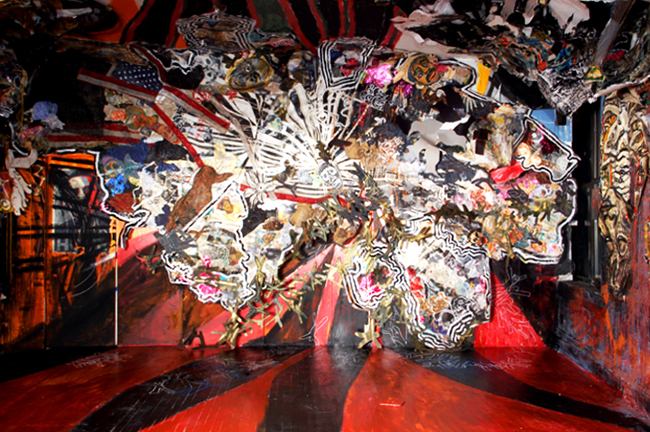 The mixed media installation, part of DeVille’s ongoing series “Universal Diagrams of Discourse,” covers the walls and ceiling, and spills onto the floor. The artist “shows the individual’s point of view when he/she comes from a place that is full of life and activity, family, heritage, culture, tradition, but also poverty, crime, and decay. This is the Bronx. It is something that most artists and citizens accept, embrace, and to some degree access pride from. Even so, this range of extremes can be confusing to an individual,” says Ruiz. The installation is dense with layers of imagery portraying life, death, rebirth, renewal, and “the transitory nature of time, place and people.” The viewer is surrounded by buildings, skeletons, birds, and cockroaches that crawl all over the walls. DeVille portrays decay and destruction, but also recognizes the light trying to find its way through the fumes, smog, and rotting environment surrounding it. “This work is reflective of the urban dweller experience and being confounded by invisible social restraints,” she says. The work is not an individual piece as much as an environment, enveloping the viewer upon entry and forcing close inspection to gain any understanding at all.